BJJ and MMA are both such vibrant sports, full of colourful characters and ever evolving techniques, it’s no surprise that students, academies, professionals etc all like to express their creativity and passion through the choice of fightwear. Many guys take their passion a step further and start up their own clothing line. It’s an incredibly exciting thing to become involved in, but very hard work trying to make it a success. Assuming the new fightwear owner trains in the sport himself, he’ll probably have a good idea of what he wants in his new gi. But it is always worth polling close friends and the online community on what they like in a BJJ gi too – though this exercise can be self defeating too. I regularly see a lot of gi companies posting out questions on their Facebook/ Twitter or forum channels asking what their followers would like to see in a gi? The end result is often several hundred comments with several hundred different opinions. As a way of operating market research, I imagine the results are not always that useful. No two people are alike and the final product will always find some people complaining it doesn’t fit right. Gi sizing can be a nightmare for established companies and newcomers alike. In my time testing dozens and dozens of BJJ uniforms, the amount of variation I have witnessed between gis proclaiming to be an A1 is staggering! Finding the balance I imagine is the key. This is the fun part – and the bit where I have direct experience – drawing up a gi design. I usually begin a gi design by establishing the elements that have to be present – for example the company logo. Then there is the aspect of deciding how decorous the gi should be compared to something much plainer. 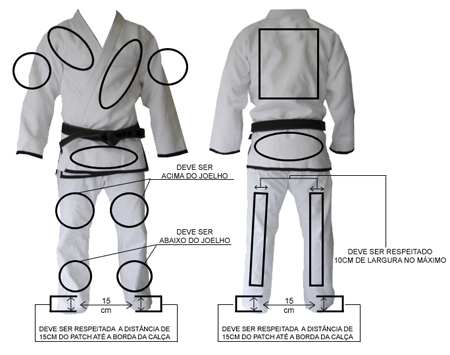 The gi should also (though not necessarily) confirm to the IBJJF rules on patch placements. As an illustrator, it’s very tempting to see gis simply as a canvas on which I can plaster Bling gis are all well and good but not everyone wants crazy artwork on a uniform so usually, it’s a balance between creating something original, fresh and most importantly, saleable. The above example, my honey badger gi (shameless plug) is heavily themed BJJ uniform and clearly designed to be a fun garment for those not concerned with tradition or being plain. When I drew the art, I already knew how I wanted the logos to be crafted – in this case, multicolour threaded embroidery. In the Ronin gi example below, the whole design is a lot less busy than the other gis I spent most of my effort on the design of the sleeve patch – mimicking the family crests – known as kamon – found on old Japanese artwork and literature. 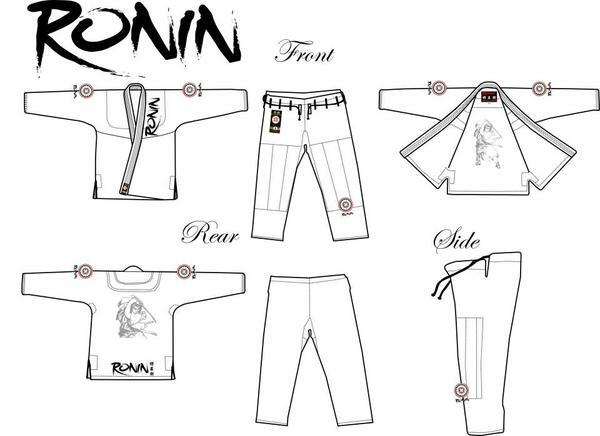 For my gi design work, I use my own custom made gi design template produced on Adobe Illustrator. The template is separated into layers – each layer controlling an individual potion of the gi. For example I can click one layer and instantly alter the colour of the side vents, or on another layer, I can alter the colour of the stitching, and so on. Illustrator is very important since the factories that make the gi parts also use Illustrator. Most gi companies hire graphic designers or illustrators to mock up a design. It is possible however to simple sketch out your idea on paper with annotations and send this to the gi maker who will interpret it the best they can and in fact I have known this to happen for many gis I have seen. The paper sketch above was for my Raptor gi and based on this sketch, the client was able to get costings from his supplier. After some dialogue I then proceeded to design the gi, which as you can see, is pretty darn close to my original back of the envelope sketch! I am quite happy to share my mockup designs on Facebook and any blog very early in the production process. Some companies show early designs, some prefer to keep projects secret until items have shipped. I can see both pros and cons to both marketing methods. From a design point of view, my worry is that most times, the final real world uniform does end up looking a bit different to the way it is presented when shown as a shiny, saturated coloured and clean vector lined mockup artwork. But it’s a small concern as most folk I guess know that a rough mockup is simply that, rough. Another problem I feel with posting designs too early is that if it is a success, people will usually still have to wait several months before they can acquire the finished product. It’s frustrating for the follower and there is a danger that initial interest could wane as newer designs from other companies crop up. But posting up early mockups can generate a lot of feedback that useful information. It also develops interaction with followers and I guess makes them feel part of the whole family vibe. The mockup is usually just the beginning – and the part of the story where I usually bow out to let the gi company take over. There is so much more to work on with the gi to be arranged, including fabric choices, cut, sizing, sample testing, timescale for final production, marketing, sales, shipping, distribution and on and on and on! If all goes smoothly to plan I estimate that a gi can go from initial design phase to final model in roughly 9 months. The analogy to giving birth to a child is apt, on so many levels! Seymour Yang runs the BJJ blog Meerkatsu. He is also an established writer, photographer and illustrator. His distinctive art style has appeared on apparel designs for many of the leading fightwear brands on the market. I really dislike the fancy looks for the Gi’s,if it were me I’d like nothing more but a tiny logo on the Gi. I’d feel like a fcking advertising billboard wearing one of them. To each their own. Even if I’d never wear a bling gi, it’s been cool seeing Seymour develop from a blogger into a gi designer, particularly as he shares the whole process, which makes for an interesting read. Really appreciate you reading the site and HUGE thanks to Seymour for opening up like he has. Funny about the tees. I pictured you quite opposite. I love it. The more patches the better =o) I love the nascar look haha. I feel very ‘dark side’ with you and Slideyfoot being much more Yoda to my Darth. Does that make Seymour a Sith? Some people just like to express their creative flair through their BJJ attire. This is one of the things that makes BJJ such an awesome sport for me (having spent 12 years training Trad JJ, where the uniform choice was dictated by the association – interestinly though, it was very bling as they insisted we wear about a dozen patches). I’m still surprised the Dragon Ball Z gi hasn’t been done to be honest. Aside from what copyright issues there might be, it seems like a no-brainer. There’s gotta be tons of DBZ nerds in the bjj community. Good article! Putting a gi together is a lot of work. I designed one for a small BJJ association and did all of the ordering from overseas. It can be very difficult to get what you want and to keep the product consistent. You gi looks very nice! Congrats!